For the sake of making ‘every effort to pursue the unity of the Spirit through the bond of peace’ (Ephesians 4:3). The following arose from a time of self-reflection on June 30, 2017. Rubel was preparing some thoughts on Jesus’ prayer for unity (John 17) to share with others in ministry. 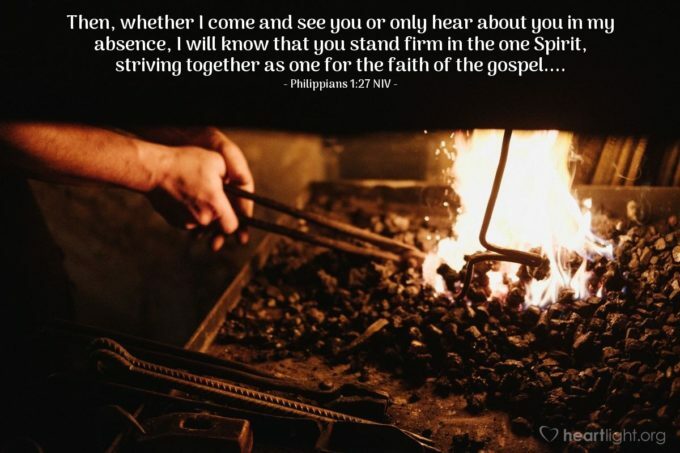 He has graciously allowed us to share these personal practices in hope of beginning a larger discussion on Christian unity among those who love Jesus, the lost, and the Bible built around some personal commitments to pursue unity in our hearts and lives. As a prisoner for the Lord, then, I urge you to live a life worthy of the calling you have received. Be completely humble and gentle; be patient, bearing with one another in love. Make every effort to keep the unity of the Spirit through the bond of peace. There is one body and one Spirit, just as you were called to one hope when you were called; one Lord, one faith, one baptism; one God and Father of all, who is over all and through all and in all (Ephesians 4:1-6). Pray for the unity of the church. If Jesus prayed for the unity of all who would believe on him through the apostles’ teaching (John 17:20-26), how dare we not pray for it as well? Pray for Christians you know from various backgrounds. Pray for the “tribes” other than your own. Don’t pray for them to change but for God to let you love them. Repent of any “tribal elitism” in your own history and heart. Each of us seeks for and (probably) finds a denomination — or subgroup within it — where she feels more comfortable. So your tribe believes the solid biblical view is “X” about the millennium, Holy Spirit, worship, baptism, or female pastors. Excellent. But please don’t think it would be impossible for you to be mistaken. We all have blind spots. And if you are correct on everything, the rest of us will more likely be able to learn from you as a humble person rather than as someone sitting in judgment on us from a posture of perfectionism. Refuse to caricature or make fun of others. Know someone who is “ultra-fundamentalist” or “super-liberal”? Know any jokes about Catholics, Baptists, or Presbyterians? Do a good imitation of Pentecostals or Health-and-Wealth advocates? It doesn’t have to be limited to their religion either. The fact of making fun of males/females, blacks/whites, Southerners/Northerners, or gays/lesbians dehumanizes them and drives a wedge between you and them that prejudices them (perhaps forever) against your Savior. Make Jesus the center of your thoughts. Don’t read the Bible to find a novel argument or to answer someone else’s position. Read it to grasp the flow of the Great Story of Redemption that leads to Jesus of Nazareth. The more you learn of his lifestyle, teachings, and way of relating to others, the more the indwelling Spirit will imprint his very likeness on you. Jesus saves you, not your scholarship or ability to play Bible Trivia and/or win arguments with your neighbors or family members. Look for evidence of God’s activity in others. Buzzards fly over thousands of acres of pasture or cropland, only to zero in on a rotting carcass. I can fall to that temptation with groups or individuals. If you see what appears to be the fruit of the Spirit in someone’s life, affirm and nurture it with everything in you. Don’t discourage or alienate someone by zeroing in on the wrong in her thinking or the failure in his life. Because you have received grace upon grace, pass it along to others. Affiliate with a church that exalts Jesus by a strong and healthy focus on Holy Scripture. “Brand loyalty” used to characterize people in buying cars or appliances. Most people now look for the best value at the best price. There is not much “tribal loyalty” left in religion either. The issue is not the name on the sign but the consistent call to the Word of God, faithful exposition of its content, and Jesus at the center of all things. Be faithful in supporting that church with affirmation, money, and time. 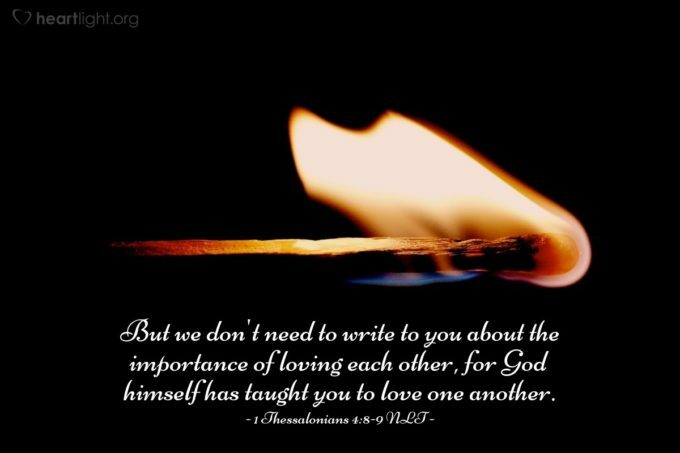 Study what the Bible says about love, acceptance, and reconciliation. These are “doctrines” of the church — just as baptism, the Lord’s Supper, evangelism of the lost, and compassion for the needy. No, love doesn’t cancel your obligation to believe and live the truth of the gospel. But your doctrinal soundness is incomplete without a commitment to breaking down the barriers that have worked to fragment his people. The pursuit of the unity for which Christ prayed begins in love for one’s neighbor that allows a respectful conversation that can lead to either agreement or a grasp of the other’s point of view. Difference is not deviance, and diversity is not an alternative word for disunity. Take “baby steps” toward reconciliation and unity. Ultimately, the unity of the church is not achieved by some sort of institutional realignment or by the establishment of a new, larger entity into which two or more smaller ones may merge. Unity is first and foremost among people. When intelligent and sincere people have an honest disagreement that does not deny an orthodox confession of Jesus Christ, their ability to treat one another as brothers and sisters is a testimony to the power of the gospel to be reconciled to one another. Maybe your “baby step” is to work with Nazarenes, Catholics, and Methodists at a non-profit homeless shelter or crisis pregnancy center. Maybe you need to cross a racial-ethnic barrier by having a neighbor family in your home for dinner. Find out where a Bible Study Fellowship or Community Bible Study group is meeting, and sign up for the next unit of study. As Jesus prepared for his betrayal, rejection, ridicule, and death, he shared his heart for all followers. Deep convictions are necessary to unity. There is no authentic unity among people who don’t really care about these things beyond what is “true for me.” A relativistic view of truth is simply a don’t-really-care posture. Our diversity of personalities, understandings of Christian doctrine, and worship preferences should not divide us into warring tribes. Even if we grant that denominations form around interpretations of certain primary doctrines (e.g., infant baptism by Presbyterians vs. adult baptism by Baptists, affusion by Methodists vs. immersion by Churches of Christ), surely there is a point at which we must stop the fracturing. The kingdom of God is not one-dimensional, and there are too many evidences in Scripture that wide spans of difference are supposed to enrich rather than destroy us. The dull homogeneity of enforced agreement is a poor substitute for the rich tapestry of color, ethnicity, gender, and interpretation among Christ-followers. Don’t be bullied by others’ narrowness. If you choose to seek peace and pursue it, someone will criticize you for it. You will be accused of compromise, although you have not abandoned a distinctive point of view; you will be called liberal, for you have extended your love to someone with whom you do not agree. Rather than abandon your attempt to live the unity of the Spirit in the bond of peace, pray for your critic. Without condescending or quarreling with your critic, draw your circle large enough to include both that person and those he or she cannot accept. It is God’s will to present the broken fragments of the church to the world in visible unity for the sake of answering the prayer of Jesus. My prayer is not for them [my apostles] alone. 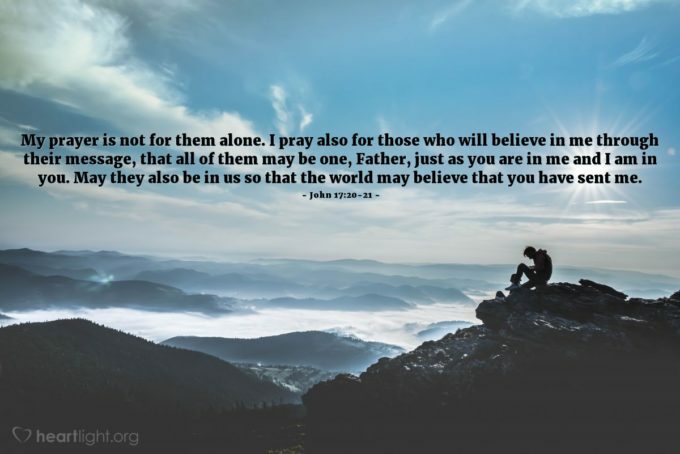 I pray also for those who will believe in me through their message, that all of them may be one, Father, just as you are in me and I am in you. May they also be in us so that the world may believe that you have sent me. I have given them the glory that you gave me, that they may be one as we are one— I in them and you in me—so that they may be brought to complete unity. Then the world will know that you sent me and have loved them even as you have loved me (John 17:20-23).